Bike trainers are pieces of equipment that allow you to use your regular bicycle as a stationary bike. 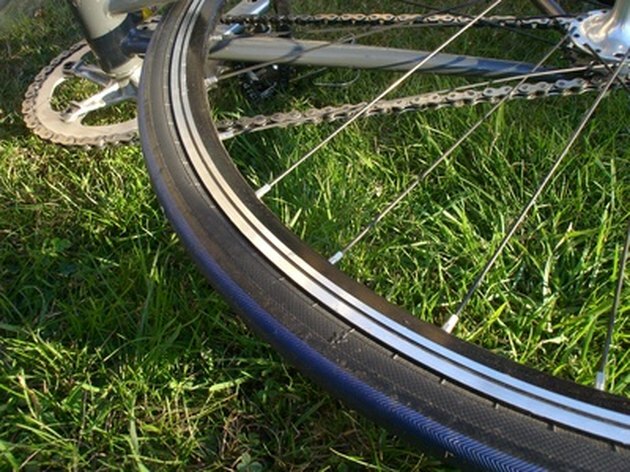 Bike trainers rely on resistance applied to the rear wheel of the bike to simulate actual road riding, and there are several different types of trainers; wind, magnetic, roller, electronic and fluid. A fluid trainer is simply defined as one that uses a viscous fluid, such as liquid silicone, to create resistance. Fluid trainers are usually the most expensive type of bike trainer. According to Tri Sports.com, the Kinetic Road Machine is the best fluid trainer on the market, and is among the two most popular fluid trainers, according to modernbike.com and Fit Werx. They rank No. 5 on the biketrainerreviews.com Top 5 bike trainers list. They're also the official bike trainer for the USA Cycling Team. Trails Edge says the Road Machine offers the most accurate simulation of outdoor riding. They range in price from $320 to $440. Other top Kurt Kinetic fluid trainers include the Kinetic Rock & Roll and the Kurt Kinetic Pro, No. 3 and No. 4 on the biketrainerreviews.com Top 5 list, respectively. These models range in price from $440 to $570. Kinetic by Kurt maintains that its fluid trainers are 100 percent leak-proof. The Fluid 2 is one of the two most popular fluid trainers, according to modernbike.com and Fit Werx, and Trails Edge claims the Fluid 2 is the best-selling fluid trainer in the world. It ranks No. 2 on the biketrainerreviews.com Top 5 list of best bike trainers. The Jet is another fluid model offered by CycleOps. These two models range in price from around $300 to $450, respectively. Fluid Elastogel Primo has received good reviews on a number of online shopping sites. While a bit pricey, the Elite models come with a function computer that allows the rider to gauge speed, slope, distance, time and elevation gain, among several others. The Primo models range in price from $275 to $480. The Blackburn Traksand comes with a lifetime manufacturer warranty, and offers features such as a progressive resistance curve, which is supposed to closely mimic open-road conditions. The Blackburn costs around $300. This manufacturer sells two models of fluid trainer; the VFS150-R and the VFS-G, which are both fluid/magnetic hybrids. Says the manufacturer, the fluid increases resistance depending on the speed of the rider, and the magnetic feature adjusts the preferred power level of the rider. Minoura's also come with a remote that allows the rider to change the resistance settings. These two models range in price from about $250 for the G model to $325 for the 150-R. Fit Werx: Trainer Shootout – Which Fluid Trainer is the Best?